The room is presidential because Buckley is about to be everywhere. She has no less than five projects in the immediate pipeline: a film, Wild Rose, for which she recently won a Dublin Film Festival award, has just hit cinemas. While that’s playing, she’ll star in the much-anticipated, big-budget Sky drama, Chernobyl, which dramatises events around the 1986 tragedy. She’s also about to perform a few live music concerts in England, where she will sing the songs from her imminent drama, Wild Rose. Jessie was recently selected by Screen International as one of its Stars of Tomorrow (previous selectees include Benedict Cumberbatch and Carey Mulligan). Forbes also just named her one of its ‘thirty under thirty’. She’s not sure what ‘a moment’ means exactly, but it does appear she is having one. And yet it feels like she, and we, will be will ready for our Jessie-themed spring. She is ready because, in fact, this apparent overnight success is really the result of a decade of showbiz Cinderella-dom and hard slog. And we are ready because she’s a gifted, gutsy performer who seems just a bit more authentic in interviews than most of our other acting superstars. Whether on- or off-screen, Jessie doesn’t seemed “sheened”, as she puts it. Her Kerry lilt is still intact. She has a kind of raw quality – over the course of a 45-minute chat she veers from salty self-deprecation – “Forbes were feeling sorry for me because I have only one year of my 20s left” – to brief tears, when her sisters are mentioned. It sounds too tremulous, too actress-y to be true, but she clearly means every moment. She seeks out characters whose “skin you can see through” and, in particular moments, she seems to offer a glimpse through hers. 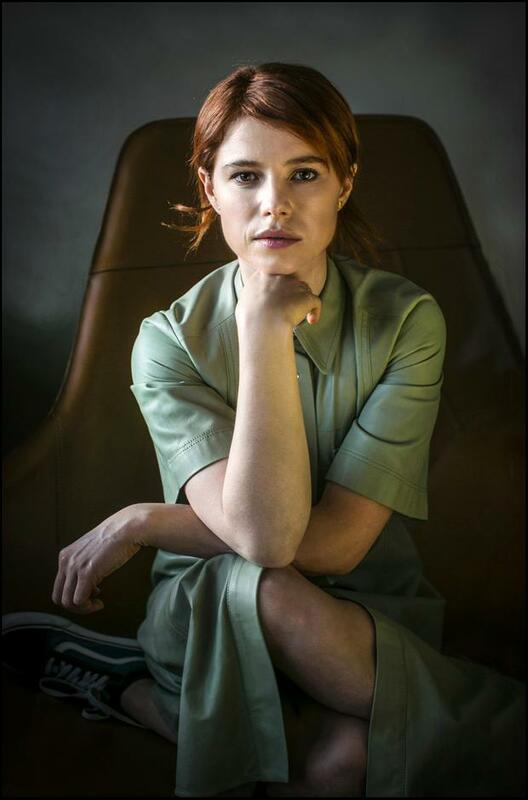 Jessie Buckley grew up in Killarney, the eldest of five sisters, and divided her childhood between school plays, choir practice, the orchestra and helping out in the family business – her father ran a guesthouse, while her mother sang and played the harp. She went to the Ursuline Secondary School, an all-girls boarding school in Tipperary, where her mother later worked as a voice coach. She dreamed of moving to London, “a place of awe”, and applied to a drama school there. While waiting to hear back from it, Andrew Lloyd Webber began auditioning for his new BBC reality show, I’d Do Anything, through which he tried to find cast members for a new production of Oliver! She decided to give the TV series a go. The day before filming began, she found out that she’d actually been turned down by the drama school, and it gave everything that followed an added frisson of urgency. She was up against some veterans of the industry, including Rachel Tucker who took the starring role in Come From Away at the Abbey earlier this year, but, despite this, Jessie found herself to be a particular favourite of Lloyd Webber. She ended up being runner-up in the series and her prize was to be the understudy Nancy in a West End revival of Oliver!, but she passed on it to play Anne Egerman in Trevor Nunn’s production of the Stephen Sondheim musical A Little Night Music. Her career continued to climb during those years. She starred as Perdita in Kenneth Branagh’s The Winter’s Tale; Marya Bolkonskaya in the BBC’s War & Peace and Marian Halcombe in The Woman in White. In 2017 she also won plaudits for her portrayal of a feisty actress, Lorna Bow, opposite Tom Hardy’s enigmatic James Delaney in Taboo, also for the BBC. Her male equivalent as Ireland’s brightest acting starlet du jour is probably Barry Keoghan, and Buckley will star alongside him in Chernobyl, which is part of a co-production deal between Sky and HBO. It will air in May. In the series, Jessie plays Lyudmilla Ignatenko – a young woman whose husband was one of the firefighters during the 1986 nuclear accident. Jessie’s other big project this spring is the aforementioned film, Wild Rose, in which she plays a young Scottish mother, Rose, who, after getting out of prison, tries to embark on a career as a country music singer. It’s an incredibly warm and funny film – miles ahead of Lady Gaga’s similar effort in A Star Is Born – and Buckley’s musical background shines through on the score, which she sang herself. That tenacity has stood to Jessie. It would seem that the years of loneliness when she moved to London were worth it – she is about to go stratospheric. Acting industry bible Variety recently declared; ‘Seana Kerslake is a star’ and, on the back of her acclaimed performance in Irish horror flick A Hole In The Ground, there can be little argument with that assessment. Kerslake’s career momentum has been building for a while. After making her mark in Kirsten Sheridan’s film Dollhouse (2012) – which she completed while she was still a third-year student of English and Music at NUI Maynooth – the 25-year-old Tallaght actress was properly bitten by the acting bug. Her turn as the titular protagonist in A Date For Mad Mary (2016) seemed to find its way into the hearts of critics and audiences alike. Not long after Can’t Cope, Won’t Cope, the RTE comedy written by Stefanie Preissner, was another triumph. Like Jessie Buckley, Kerslake has a salty authenticity and big things are expected of her. When it was announced earlier this year that this Clare woman would be taking one of the lead roles in the new Game Of Thrones prequel, few observers were surprised. At 39, Gough is no starlet but has built her career the old-fashioned way, learning her craft on the stage and gradually building into bigger television and film parts. In 2015 she beat off competition from Nicole Kidman to win an Olivier Award for her starring role as an addict in People, Places and Things. The performance “changed my life,” she admitted, and propelled her to greater things: There was the stage revival of Angels in America (for which she was nominated for a Tony) and the lead in the Gothic BBC thriller Paula. Last year she caused a minor stir for playing a trans character alongside Keira Knightley in Colette and, while she recently said she would be fine with never making another movie, she is about to appear alongside Jamie Bell in The Chain, an adaptation of a Tobias Wolff novel. She’s a sister of Kelly Gough, who recently appeared in Call The Midwife. Some actresses burst onto the scene and some are more of a slow burn. With a career dating back to bit parts in Angela’s Ashes (1999) and Intermission (2003), it took this 36-year-old Tipperary-born star another decade to establish herself in Hollywood. She would go on to work with legends such as Sean Penn, Dustin Hoffman and Nick Nolte on This Must Be The Place and also scored roles in The Last Station, HBO’s big-budget drama Rome, and Luck, in which she caught the eye of Vince Gilligan. He cast her in the Breaking Bad prequel Better Call Saul, in which her performance as the gimlet-eyed Stacey won her comparisons with Jodie Foster. Since then she’s been in Martin McDonagh’s Three Billboards Outside Ebbing, Missouri (2017) – the writer is an old friends of hers – and more recently she has starred in Sharon Horgan’ acclaimed series, Women On The Verge. With an upcoming starring role in Dreamland – alongside Margot Robbie – Condon looks finally to be on the verge of superstardom.